Floating a gob of roe below a bobber, or back-bouncing a tiny cluster of salmon eggs into a deep pool, are two of the most effective techniques for catching fall king salmon on the coastal rivers of Oregon, Washington and California. The key to successful bait fishing for kings is having good eggs, cured properly. 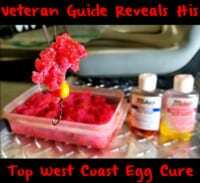 I have used countless variations of commercial cures mixed with other ingredients, and for fall kings my favorite is what I call “extra sweet” salmon eggs, a combination of Pautzke’s Pink and Red Fire Cure with added sugar and borax. The extra sweet eggs are often different than what everyone else is using. The sugar makes them sweet, sometimes triggering strikes from fish that normally wouldn’t bite, while the borax helps increase the shelf life of the bait while it is in the fridge, allowing you to keep the eggs for several weeks before freezing them. For extra sweet salmon eggs, I like to use 1 cup of Red Fire Cure, 1 cup of Pink Fire Cure, 1/2 cup sugar and 1/2 cup borax. The mixture of Pink/Red Fire Cure creates a brilliant bright red bait, instead of the deeper, darker red of plain Red Fire Cure. To cure eggs, begin by butterflying the skeins from top to bottom. Split the skeins in half lengthwise, which will help the eggs cure more evenly, while also reducing the number of loose eggs when you cut the roe into bait-size pieces. Next, take the sections of roe that have been butterflied and cut those into chunks between the size of a golf ball and tennis ball. It is important to cut the sections crosswise along the fold, or rib, of the skein. You will notice numerous rows of eggs. Cut between the rows to avoid breaking the skein into a bunch of loose single eggs. Don’t cut into bait-size pieces yet. Instead, cut the half skeins into five or six pieces, which allows them to more evenly cure. I will cut these chunks of roe into bait-size pieces just before I fish them. Place the eggs in a plastic bowl or container to add the cure. In a plastic bag I mix the one part Pink Fire Cure, one part Red Fire Cure, half part sugar and half part borax (many anglers use Natural BorX O Fire for this). After the ingredients are thoroughly mixed together, they are ready to sprinkle onto the eggs. Make sure the sugar and borax are well mixed and there are not large gobs of borax or sugar. Pour a generous amount of the cure onto the eggs and gently mix. Be extremely careful not to crush the eggs. After mixing, add more cure and mix again. Typically, I use 1 cup of cure for 4-5 cups of eggs. After the eggs have a light coating of cure they are ready to be placed in a large plastic zipper bag to be cured. I like to cure the eggs in gallon bags and cure them at room temperature. The cure works best around 50 degrees. A cold fridge will slow down the curing process, while heat will ruin the eggs. 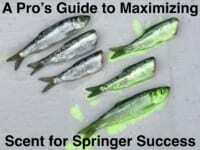 If you want to add scent, now is the time to add a few drops of Liquid Krill, tuna, shrimp or sardine oil. I like to cure the eggs in the garage, but will place them in the fridge if the weather is hot. After a few hours you will notice the eggs are beginning to juice up. The cure causes the eggs to expel liquid. The eggs will later soak most of the juice back up. Don’t pour out the excess juice until the eggs have cured for at least two and preferably three days. I like to turn the plastic bags of eggs over every six to eight hours. After three days, you will notice the eggs are plump and ready to be dried and stored. If you dump out the juices early, the eggs will be smaller and not fish well. After three days of curing, these eggs are ready to be dried. They are plump and round, and preserved well enough to store in the fridge for weeks at a time. The sugar and borax has been soaked up by the eggs. Before fishing, the eggs must be dried. Drying toughens the eggs up and makes them last longer in the water. Eggs that have not been dried will milk out in just a few minutes and turn white. Eggs that have been dried too long will fish like rocks and not milk out. For bobber eggs, I like to dry the eggs for 8-12 hours. For back bouncing, I will dry for up to 24 hours. I spread them out on newspaper (don’t worry about the eggs soaking up ink, they won’t). Drying outside with a gently breeze works best. After drying, place the eggs in a clean bag and keep cool. They can be stored in the fridge for up to a month, or frozen and used next year. Glass jars work best if you plan to freeze for more than a few months. When fishing, cut the eggs into smaller nickel to quarter size pieces. I like to add scents into the bait tray, or cut up sand shrimp. Editor’s Note: Andy Martin is a full-time Oregon fishing guide who lives near the Chetco River in his hometown of Brookings. His web sites are wildriversfishing.com and brookingsfishing.com.